This pretty craft is simple for the kids to do, but will take pride of place wherever it is displayed! Perfect for Spring or a Chinese New Year or Japan theme. Mix the paint with an equal part of water. Dot on the paint, to make your blossom. Paint several different trees around the lantern. When you are happy you have enough blossom leave the paint to dry. When the paint is dry use the black pen to draw on the branches of the trees. 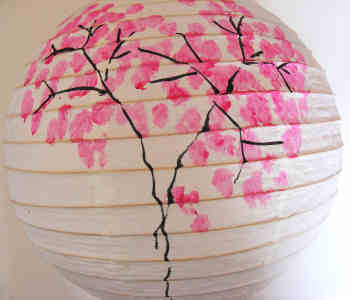 Alternatively you could draw or paint Chinese calligraphy characters onto your lantern to decorate it.